Now that we have the trolling motor in Fishing Sim World we wanted to provide a short guide on how to use it. This article will explain how to use it with the controls for each platform included. If you are playing on PS4 you can drop the trolling motor in to the water by pressing R3. You will see the motor drop down in to the water and it will be ready to use. To start controlling the trolling motor you will need to hold the X button. This will cause the interface to be highlighted to show that you are now controlling it. With X held use the up and down directional buttons to adjust the speed of the trolling motor. The direction of the motor is controlled with the left and right directional buttons. If you are playing on Xbox One (note that these controls will also apply if using a controller on PC) you can drop the trolling motor in to the water by pressing the right stick. You will see the motor drop down in to the water and it will be ready to use. To start controlling the trolling motor you will need to hold the A button. This will cause the interface to be highlighted to show that you are now controlling it. With A held use the up and down buttons on the d-pad to adjust the speed of the trolling motor. The direction of the motor is controlled with the left and right buttons on the d-pad. 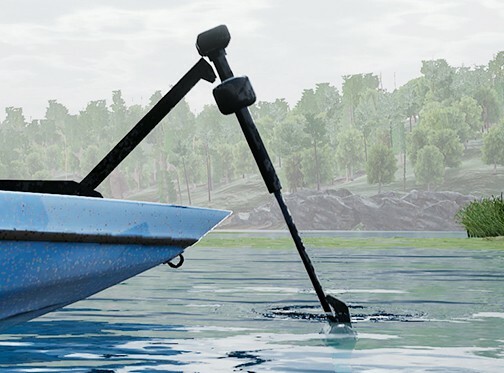 If you are playing on PC using a keyboard and mouse, you can drop the trolling motor in to the water by pressing T. You will see the motor drop down in to the water and it will be ready to use. To start controlling the trolling motor you will need to hold the Shift key. This will cause the interface to be highlighted to show that you are now controlling it. With Shift held use the up and down arrow keys to adjust the speed of the trolling motor. The direction of the motor is controlled with the left and right arrow keys.